It’s no April Fool – PB Assist+ is on sale this month! Save 10% throughout April 2013 when you order this wonderful product. Easily improve your digestive health with these probiotic capsules. Visit my storefront and help yourself stay healthy this season. Sale Price 10% off – purchase in April 2013 for only $41.40. Save even more: contact me about purchasing either a 1 year membership for only $35 (to save approximately 25% off all purchases) or a 1 year membership for only $10 (to save approximately 20% off all purchases)! There are 30 capsules in a bottle. Take one double-layer capsule 3 times daily, with food for five days each month to reset and re-colonize your friendly digestive flora. Can be used more frequently and for extended periods of time when digestive flora has been compromised by antibiotics or other digestive stressors. Also may be used when traveling to boost digestive immunities, or once a day as an ongoing maintenance program for people with chronic digestive discomfort. Some people may experience an initial change to digestive schedule and function when they begin using pre-biotic FOS and probiotics. For most people, these symptoms are mild and should disappear after a few days. Pregnant or lactating women and people with known medical conditions should consult a physician before using. Do not use if bottle is opened or capsules are broken. 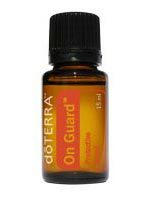 During November 2012 – Save 10% on your purchase of OnGuard® Protective Blend. Just in time for cold and flu season! Click HERE to get all the details. Ready to purchase? Visit my storefront and help boost your immune system this fall. Save even more: contact me about purchasing a 1 year membership for only $35 and save 25% off all purchases!